I’ve used bags, cases, sleeves, covers, shells and any other form of ‘transport vehicle’ for my laptop and accessories over the past few years. Very few of have withstood the test of time as any inadequacies become annoyances that put you off from using it. Put your hand up right now if you’ve been in this very same situation as me. For women it’s handbags. For the rest of us it’s probably the bag or case that we take when we travel or go to work. It’s very much a competition of fashion even for the thing that carries your laptop hence the rainbow coloured sleeves and fluffy covers. So when it comes to making that decision to buy THE case that’s going to carry your ‘stuff’ with you, then it’s got to be the right one. I want to introduce you to booq. 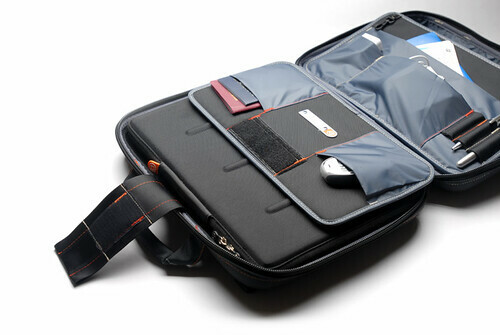 Maker of bags, sleeves and cases for all of your gadget needs big and small. Whilst they aim for the professionals market, anyone can tap in to the excellence of the booq philosophy. With a design paradigm that focuses on usability and durability, you can expect to see, hear and feel a quality product. I’m testing the 17-inch model of the vyper exo XL, which will fit the 17-inch MacBook Pro even though I’m using it with a 15-inch MacBook Pro. 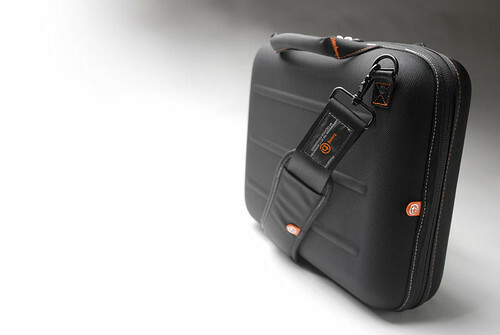 The case has measurements of 438 x 381 x 108mm (w x h x d) and has a weight of 1.82kg. 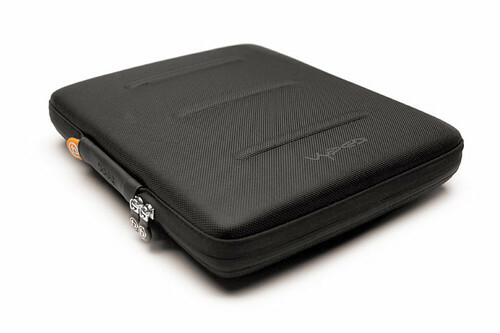 When the vyper is closed up, it’s no bigger than other notebook cases despite the space available inside and the fact that it’s designed to fit a 17-inch notebook. There’s an impossible number of pockets inside the vyper. It boggles my mind as to how it all fits in there. Deceptive as it looks on the outside, the booq have designed the vyper to open up in to a whole layout system for taking your office on the road. The zips open right down to the other end of the bag and allows it to split down the middle, opening up 180-degrees to reveal the compartments. You’ll be confronted with a section for storing your notebook, a centre section packed with pockets and then another section for storing your power adapter and various other items. This is truly stunning and one of the reasons why I love taking the vyper with me to work everyday and when I’m travelling over any other case. On any given day, I’m able to fit my MacBook Pro, power adapter, mobile phone charger, flash stick, iPod, wallet, Razer Pro desktop mouse and several bits and pieces of stationary. Even with all that in, there are still pockets that remain empty. 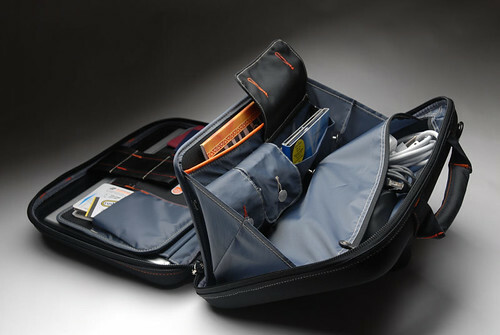 The compartment for holding your notebook is padded with a soft lining to protect it from scratches and provides protection from both sides through the use of a velcro strap, which holds the compartment together whilst in transit. 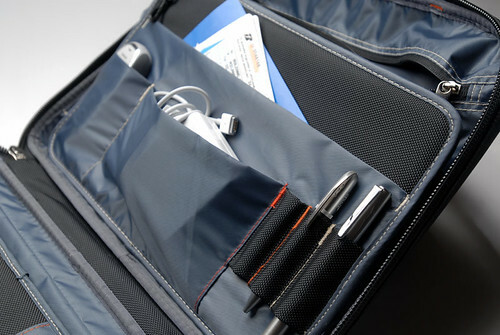 This prevents items that may fall out of the pockets or shake about from scratching up your notebook. You will find that the generously sized pockets will fit nearly anything you want from CD’s and magazines to your mp3 player, keys and whatever else you can think of that you would ever want to take with you on a business trip. Even though this case is designed for the 17-inch MacBook Pro, it is able to hold my 15-inch model without any issues in stability or problems in securing it so that it doesn’t move about whilst in transit. The Velcro strap does a very good job of holding everything in place. I love the oversized zippers. It makes it easy and quick to unzip and open up the case. A nice chunky shoulder strap will sit comfortably on your shoulder with its nice padded foam strap. 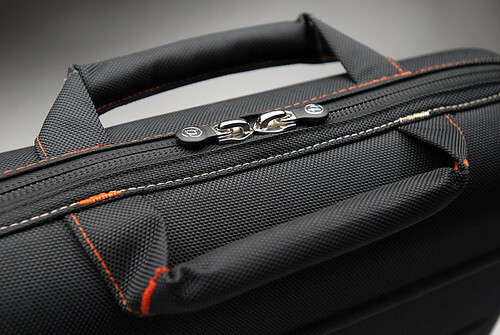 Comfortable for those who like to carry the case on their shoulder – my personal preference is to use the two handles to carry it briefcase-style. The entire exterior is made of ballistic nylon. This is something I’ve seen before on laptop sleeves and is a very robust material but is lightweight at the same time – so tough that it was used in the military for protective clothing back in World War 2. Having pushed the vyper exo to the limits during the month I’ve spent transporting my electrical goods from place to place, I can safely say that the money you’re going to spend on this case is going to be worth every penny. Despite putting it through some rough treatment including cramming two laptops in at the same time at one point and throwing it in and out of the car, not one build quality issue has cropped up. The stitching, the zips, the pockets and the strap are still as they are when I first got the vyper exo. The last feature I’m going to talk about is probably more of a gimmick than something that will actually work in today’s world, but that’s the cynic inside talking. All booq bags come shipped with a unique serial number, which you can register on their web-site. Once registered you’ve essentially created an account that registers your unique serial to your e-mail address and if you choose, your address as well. In the event that you misplace or lose your case and some kind soul picks it up and sees the serial, they can report it to booq and booq will get in touch with you to advise you on how you can get your case back hopefully. booq sell a range of bundles where they put together two or three of their products for a complete protective collection that you can purchase in one go. 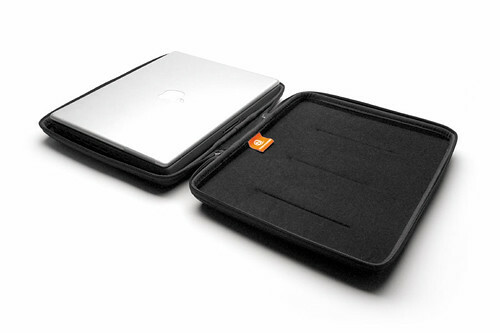 A vyper M2 came with my booq vyper exo XL and acts as a compact case or sleeve for your notebook. 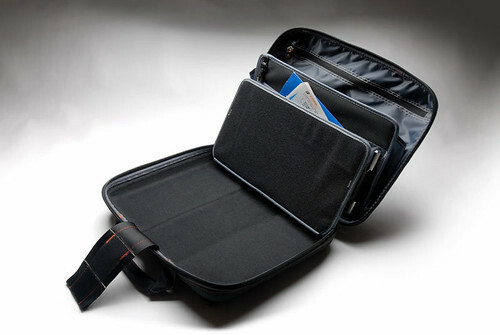 booq describe this product as a protective sleeve that can be used independently but is designed to be used as additional protection inside another bag. The M2 is constructed of the same ballistic nylon material that is found throughout their product range and allows for under arm carrying. 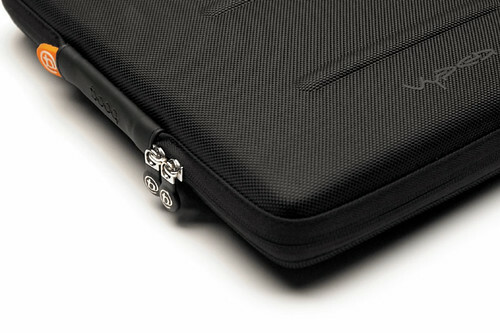 Zips go nearly all the way around the sleeve so you can unzip and use inside of the case, but unlike sleeves like the Moshi Codex, it doesn’t have any straps to keep the notebook securely attached to the shell of the case, so the back cover just flops backwards. booq clearly have an eye for detail and they know a thing or two about constructing these notebook cases with attention to build quality and durability. What I am most impressed with is the smart thinking in the layout of the insides, which allows you to manage . booq are so confident about their build quality that they’ll even put money where their mouth is by backing your case up with a five year guarantee. Combine that with the free Terralinq service and you’ve got an offering from booq that is quite good value.